Steam curing employed for faster strength gain due to higher hydration rate may lead to shrinkage issues, and hence the use of moderately high early strength cement (MESC) is proposed instead of typically used high early strength cement (HESC) which has a high C3S content. This paper evaluates the suitability of MESC for use in precast concrete. The objective was to (i) determine the feasibility of MESC in recycled aggregate concrete (RAC), (ii) determine the optimum steam curing conditions (curing duration, maximum temperature, and duration of holding maximum temperature), and (iii) evaluating the beneficial use of reduced binder content to compensate for steam curing. Four series of RAC were developed which were subjected to nine different steam curing condition, and the resulting strength properties were determined. Though all the developed concrete specimens achieved the design strength of 30 MPa, those cured at 50 °C with 1 h duration of exposure to maximum temperature exhibited the best performance. Further, it was found that even though reducing the binder content reduces the ultimate strength at 28-day age, curing at 70 °C with 2 h exposure to maximum temperature duration (for 7% reduction in binder volume) leads to merely 11.8% strength decline. It is concluded that MESC can be effectively used in steam cured RAC instead of OPC and HESC with meagre strength loss when cured at maximum temperature of 50 °C maintained for 1 h while the total curing time being 4.5 h. Thus, utilizing MESC in RAC shall not only help combat the persistently declining natural resources but also reduced the associated carbon dioxide emissions, thereby promoting sustainable development. Persistently depleting natural resources have led the construction industry to adopt alternative materials, processes, and techniques to attain sustainable development through “reduce, reuse, and recycle” approach. The three pillars of sustainability including economic viability, societal acceptance, and environmental friendliness [1, 2] further establish the guiding principles for construction industry. Therefore, since the past few decades major technological advancement has been seen in construction materials including (i) use of alternative binders like geopolymers , magnesium phosphate cement [4, 5], and magnesium oxychloride cement [6, 7], (ii) use of supplementary cementing materials in concrete [8, 9], and (iii) use of waste or recycled aggregates in concrete [10, 11] such as sanitary ceramic waste , brick ceramic wastes , glass waste , and plastic waste . Among the aforementioned techniques, waste aggregate recycling has gained special interest among the researchers as it reduces the environmental burden due to lower associated CO2 emissions [16, 17] and saving the inconvenience of dumping the waste concrete in landfill. Since the use of recycled aggregates (RA) in concrete, researchers have been trying to investigate the usefulness of using RA in concrete. In this regards, various experimental findings have shown clearly that using RA in lieu of natural aggregates (NA) leads to inferior resulting properties making the recycled aggregate concrete (RAC) use in less important structures [18, 19]. However, this narrative was proven wrong by using a blend of aggregates and incorporating micro or nano fillers in concrete for improved mechanical attributes [20, 21, 22, 23, 24] Once the structural use of RAC was established, it opened further doors for researchers to explore its applicability and limitations [25, 26]. In this regards, the use of RA in precast construction industry is worth mentioning. Precast concrete is employed to ensure (i) quality control, (ii) faster fabrication and construction, and (iii) ease of erection of structural elements at the construction site [27, 28, 29, 30]. In order to attain speedy fabrication of precast elements, use of high early strength cement [2, 31] and steam curing [16, 17] has been shown beneficial. It is, however, interesting to see that only a handful of research findings are available on the determination of optimal steam curing regime parameters [32, 33, 34] which particularly deal with ordinary concrete. It is seen that it has become customary to adopt the typical steam curing as suggested in . Steam curing is an energy intensive process, and it should be adopted for extremely demanding circumstances. Also, the curing parameters should be optimized to reduce energy wastage. 8 h curing cycle for normal concrete was proposed for SCC  whereas 60 °C was suggested for UHPC . In another work, it was proposed that for normal concrete use of high temperature steam curing (as high as 85 °C) is beneficial in improving the early-age strength . Further, a few studies on steam cured RAC presented contradicting results [38, 39]. Kou et al. attained improvement in resulting properties by subjecting the concrete to 18 h long curing cycle, which may be useful but economically unviable solution . Thus, the need to further explore this less focused area, particularly for RAC is compelling rather overwhelming. As discussed earlier, some of the published findings have comprehensively evaluated the suitability of steam curing in normal concrete, but these were only focused on concrete produced with ordinary Portland cement (OPC) as the binder. Evaluating the resulting properties for RAC containing MESC in these scenarios is imperative. Although RAC properties under steam curing have been evaluated previously, the studies on the determination of the optimum steam-curing conditions (like peak temperature, cycle length, and the holding duration of the maximum temperature) are sparse. Further, the properties of RAC made with MESC have not yet been determined. This demands an in-depth evaluation of the RAC properties containing MESC, and the determination of the optimum parameters for the steam-curing cycle. 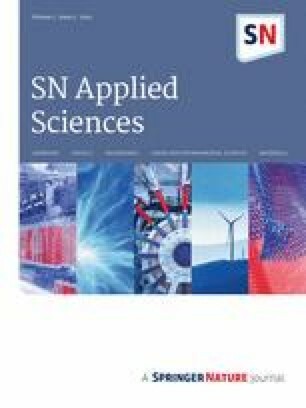 This experimental study fills the current research gap by exploring various properties of steam-cured, high early-strength RAC. The steam-curing conditions were also varied, so that the steam-curing conditions for optimum concrete properties could be ascertained. The novelty of this study lies in the determination of the optimum steam-curing parameters for recycled aggregate concrete, incorporating moderately high early strength cement. The primary binders used in this study included ordinary Portland cement (OPC) and moderately high early strength cement (MESC). The materials characterization details have already been published earlier in  (specific gravity of OPC and MESC: 3.14 and 3.17; Blain surface area: 3340 cm2/g and 4490 cm2/g; loss on ignition: 2.26% and 1.05%, respectively, conforming to Korean Standards KSL5201-1989. The cement used was produced in the Republic of Korea by the Sungshin Portland Cement Co. Ltd.). Coarse and fine aggregates (both natural and recycled) are shown in Fig. 1, while the raw materials characteristics are reported in Table 1 and Fig. 2. These properties helped to determine a suitable mix-proportion (Table 2) for design strength and workability requirements. These tests were conducted under the guidelines of Korean Standards (KS) [40, 41, 42, 43]. The mix design procedure and concrete mixing, casting, and curing were done according to American Concrete Institute (ACI) standards [44, 45, 46], and explained by the authors in previously published findings [2, 16, 17, 31, 47] and are hence not repeated here. The mix proportions for each series are given in Table 2. The design strength was 30 MPa while the minimum target slump was set to 150 mm (aggregates were assumed in saturated surface dry (SSD) conditions in the mix formulation procedure, and water adjustment was made later based on the stock condition). The series mentioned in Table 2 were named in the nomenclature according to the binder and aggregate type used to fabricate that particular mix. As indicated in Table 3, four series of concrete mixes were formulated while a control mix was also designed for comparison. The one named “O100-N-60-4” indicates that the mix was formulated for OPC binder, all natural aggregates, maximum temperature of steam curing as 60 °C which was maintained for 4 h. Similarly, “M100-R-series” refers to the mix with MESC binder and recycled aggregates (optimum blend of aggregates as (40% natural coarse + 60% recycled coarse) and (60% natural fine + 40% recycled fine) aggregates); it is further assigned different IDs based on the curing temperature and duration. The mix series with M93 and M86 refer to the mixes where the MESC binder volume is reduced by 7% and 14%, respectively. As the total volume had to be kept constant for a fair comparison, the disparity was compensated by the increased aggregate volume. The quantities were then computed based on the corresponding specific gravity. The aforementioned percentages of optimal blend of aggregates were based on previous studies [16, 17, 28, 29, 48, 49], which led to the determination of the optimum performance-based (strength and durability) blend of aggregates (natural and recycled). The concrete was mixed in a rotating drum type mixer. First, all of the required coarse aggregate was put in the mixer along with 50% of the cement. These were mixed for 1 min while progressively adding 50% of the required water. After 1 min, the fine aggregate, remaining water, and cement were added while the mixer continued to rotate for three more minutes. Polycarboxylate Ether (PCE) based admixture was also used for improved flow characteristics particularly for RA containing mixes where the higher water absorption could lead to harsh mix. Admixtures were added simultaneously with the water. The whole mixing procedure took around 4 min. Subsequently, the specimens were cast in molds of various sizes. Cylindrical specimens with a diameter of 100 mm and a length of 200 mm were cast, for compressive strength testing . Specimens were subjected to steam curing under varying conditions (Fig. 3), e.g., the maximum steam-curing temperature and the maximum holding duration. The details of these parameters are already set out in Table 3. Another mix (O-N-60-4) was also formulated for the conventionally used steam-curing regimen. The nomenclature stipulated in Table 3 refers to five parameters, namely cement type, cement content, aggregate type, the maximum temperature of the steam-curing cycle, and the duration of holding/maintaining the maximum temperature of the curing cycle. For instance, the mix ID M86-R-70-2 refers to the concrete mix incorporating MESC as the primary binder with 14% (by volume) less binder content than the control, and the recycled aggregate blend (both for coarse and fine aggregates), with the maximum temperature of the steam-curing cycle set at 70 °C, maintained for 2 h. The curing cycle was designed based on the empirical cycle length in accordance with the Portland Cement Association (PCA) . Various parameters were employed in order to determine the optimum parameters based on the mechanical strength of the resulting concretes. The properties of the developed concretes (both in fresh and hardened states) were evaluated by various ASTM testing standards [50, 51, 52, 53, 54]. Figure 4 shows various steam-cured samples being removed from the molds, and the compression testing setup. Fresh state properties were determined by a slump cone and digital air content meter (images are not shown due their common use in concrete testing). The specimens were tested at various curing ages, to assess their attributes at various hydration stages. The compressive strength testing was done by crushing the cylindrical specimen (100 mm diameter) in an automatic compression testing machine (5000 kN capacity), subjected to the loading rate of 2.4 kN/s . The fresh state properties including the slump (mm) and air content (%) of the concretes are shown in Fig. 5. Both the cement and aggregate types affect the resulting properties in fresh state due to the different individual characteristics (surface area, particle size, specific gravity, particle shape, water absorption, etc.). 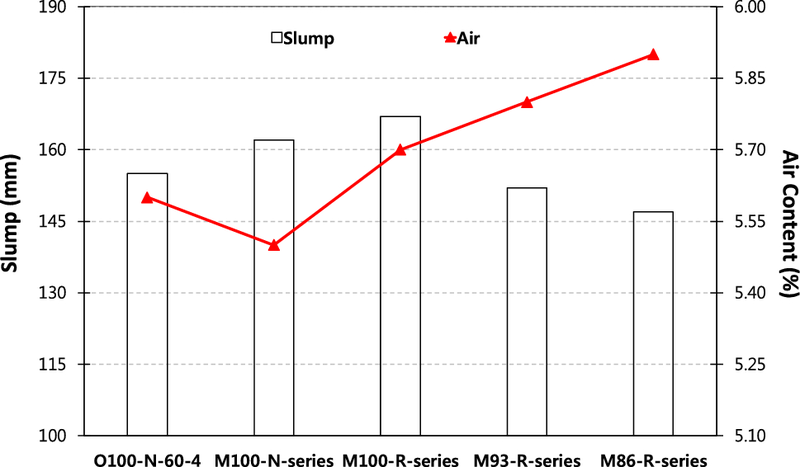 Mixes containing 100% MESC showed higher workability, as indicated by the greater slump values. As the percentage volume of binder (MESC) reduced, the slump reduced as well. Also, recycled aggregates further increased the slump. The findings are similar to previously published results [16, 17, 55] by the same authors. The rounded aggregates may upsurge/increase the workability of fresh concrete due to a “ball-bearing” effect . As explained, such an effect can be attributed to the pretreatment (grinding, churning, and chemical processes) for adhered mortar removal, which may lead to the breaking of angular ends of aggregate particles, resulting in more spherical shapes . The air content results were rather different to those obtained for the slump. The air content tended to increase in the concretes that contained recycled aggregates and MESC. 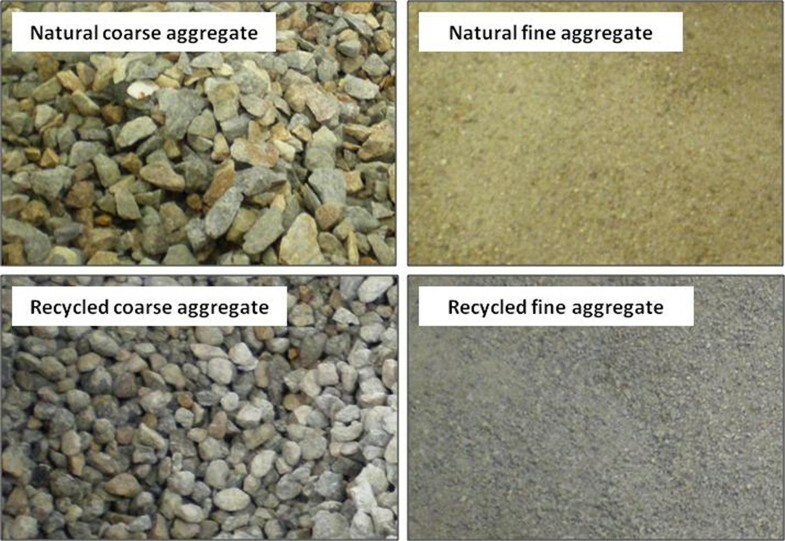 This can be explained by the poor packing of the somewhat rounded aggregate shape (of recycled aggregates), in contrast to the angular grains (of natural aggregates). The greater air content also signified an anticipated decline in compressive strength, due to a greater void ratio and lower gel/space ratio. As the present study primarily focused on the effect of varying steam-curing conditions, the positive (or negative) effects will be reflected in the hardened concrete (as can be seen from the compressive strength results). It is, however, worth mentioning that the published literature on the fresh state properties of RAC contains disparities owing to the varying w/c ratio, mixing method, and most importantly, the bonded/adhered mortar with the recycled aggregate surface [57, 58]. The compressive strength results are shown in Figs. 6 and 7. The values are averages of three specimens, while the SD/error was less than 4%. Figure 6 shows the absolute values of the strength data obtained experimentally for specimens at various ages (1-day, 7-day, 14-day, and 28-day) while Fig. 7 shows the strength disparity due to varying parameters (aggregate, binder, and steam curing conditions). Typically, strength increases with age is a common phenomenon associate with hydration. The greater the hydration, the higher is the gel/space ratio leading to increased strength. All the designed mixes reached the target of 30 MPa for steam curing cycle of 50 °C as the maximum temperature. On the other hand, the specimens subjected to higher temperature curing of 60 °C and 70 °C, led to target strength development at 28-day age, whereas a few of them (with MESC binder volume of 86% could not even reach the desired value. From these results, it can be well concluded that the MESC binder volume content should not be reduced by more than 7% in concrete mix design. Moreover, the curing temperature should not exceed 50 °C for attaining superior mechanical properties. It was observed that the compressive strength of the specimens decreased as the maximum temperature of the steam-curing cycle increased. A possibility for such anomaly might be the possible deterioration of hardened concrete due to excessive heating. However, this might not be similar to some of the previously published findings [59, 60] previous work which may be attributed to the cement type (Moderately High Early Strength Cement) and aggregate type (Recycled aggregates). A great disparity in strength was observed when compared to the control mix (O-N-60-4). This is consistent with the findings previously published by different authors [61, 62]. The maximum temperature for efficient curing under the same conditions, as used in this experiment, was estimated to be 50 °C. The results are in agreement with the previous findings , where it was shown that the reduction in mechanical properties of the RAC was “more pronounced in water curing than in steam curing”. Also, the precast concrete elements with RA incorporation using steam curing have been proven to meet the strength and durability requirements. 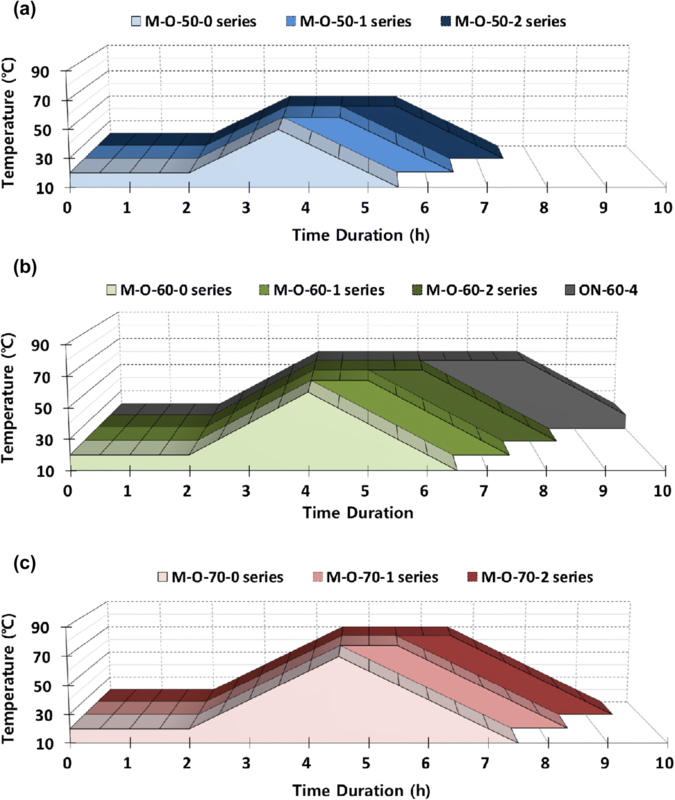 Another steam-curing parameter evaluated in this study was the duration for which the maximum temperature was maintained. The experimental study demonstrated that a 1-h holding duration of the maximum temperature was optimum. Previously, Ramezanianpour et al. [32, 34] had shown that for self-consolidating concrete and for concrete containing mineral admixtures, a lower duration of exposure to the maximum temperature was more beneficial. The experimental findings in the current study corroborate similar outcomes for RAC. This clearly shows that maintaining the peak temperature for a greater time period is not of increased benefit. Not only is the strength reduced, but more resources (energy and cost) are also expended, which hinders the sustainability goals. It is also imperative to specify the higher rate of shrinkage due to the very high temperature. Typically, the increased temperature is thought to increase the early strength of concrete due to an increased hydration reaction. However, this generalization cannot be guaranteed for a different cement type that has a moderately high early strength (as used in this study). Both the physical properties (fineness and surface area), and chemical composition, play a fundamental role in the rate of the hydration reaction. The fact that the tested concrete had a high compressive strength despite the recycled aggregate, low temperature steam curing, and short duration, may be due to the characteristics of the moderately high early strength cement. It is also important to note that conventionally-produced high early strength cement has a higher C3S content than ordinary Portland cement. Therefore, the early strength is high, and the hydration heat and drying shrinkage are increased, while the long-term strength is lower than that of ordinary Portland cement . It is suggested that the lower content of C3S and the increased content of C2S in moderately high early strength cement lead to its improved attributes. 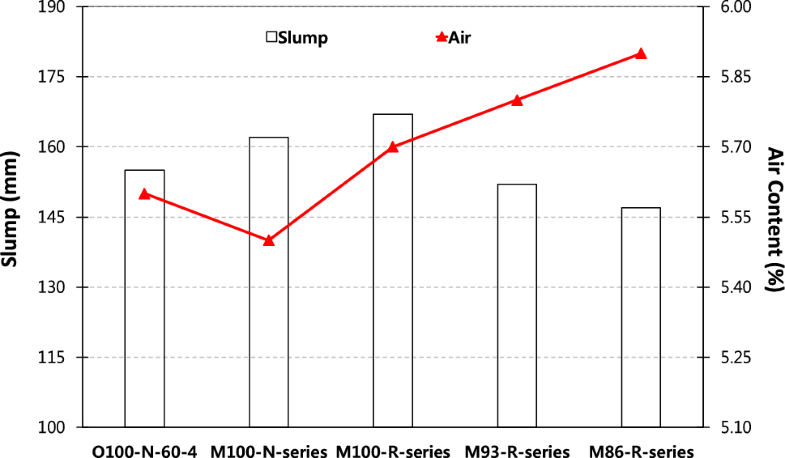 In this experimental study, the properties of steam-cured recycled aggregate concrete (RAC) incorporating moderately high early strength cement (MESC) were evaluated in an attempt to determine the optimum conditions of a steam-curing cycle for RAC as well as determining the potential of reducing binder volume in concrete by exploiting the benefits of steam curing. The objective was to (i) determine the feasibility of MESC in recycled aggregate concrete (RAC), (ii) determine the optimum steam curing conditions (curing duration, maximum temperature, and duration of holding maximum temperature), and (iii) evaluate the beneficial use of reduced binder content to compensate for steam curing. Four series of RAC were developed which were subjected to nine different steam curing condition, and the resulting strength properties were determined. The optimum conditions for steam curing based on the strength criterion were a heating/cooling rate of 20 °C/h and a peak temperature of 50 °C, maintained for 1 h.
In steam-cured RACs, and for other matters typical concretes, the binder volume content can be reduced by 7% without appreciable strength loss. The research findings point towards low-cost and sustainable application for steam-cured RAC in precast concrete construction, where the objective is rapid construction with excellent mechanical properties. The use of recycled aggregates can slow the depletion of natural resources and help promote sustainable development. It is, however, clarified that the accelerated hydration for faster strength gain might lead to shrinkage and cracking, which must be evaluated prior to critical structural elements, particularly for structures with a higher ratio of surface area to depth, such as slabs and pavements. Nevertheless, the use of shrinkage-reducing admixtures or expansive cement can reduce the likelihood of such cracking. It is noteworthy, that MESC was sued in this experimental work instead of conventional high early strength cement (HESC) to mitigate potential shrinkage cracking. Although the use of steam-cured RAC with optimum duration and temperature conditions ought to maximize the resulting mechanical attributes, the cost of achieving this and the associated carbon dioxide emissions must also be evaluated to determine the overall impact. This work has supported by the National Research Foundation of Korea (NRF) grant funded by the Korea government (MSIT) (No. 2018R1C1B6009247) and supported by the National Research Foundation of Korea (NRF) Grant (No. NRF-2018R1D1A3B07045700) funded by the Korea government.